On 24 September, 2011, I attended the Paranormal Investigators Course run by Validate. I loved this course, found it incredibly informative, and found the subject matters of extreme relevance to our work in APPI. 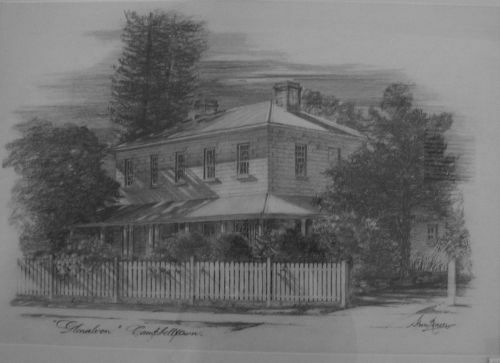 At the conclusion of the course, Andrea and Attila had arranged for us to hold a paranormal investigation at the Glenalvon Homestead in Campbelltown. This was a very unique opportunity, as the property is furnished with furniture from the era the house was built, and this was the first time a paranormal investigation had ever been held there. "Glenalvon has been described as 'An exceptional two-storied sandstone home of colonial Georgian design' (National Trust), and 'A rare example of a residence and garden of its period, size, diversity, integrity, and quality' (Otto Cserhalmi and Partners, Heritage Architects). Glenalvon was built by Michael Byrne, son of Wicklow rebel/patriot Hugh “Vesty” Byrne circa 1841 and consists of the two storey main house, the earlier Servants Quarters, and a Victorian Coach House and Stables. A custom built slab shed was constructed in 1995 to protect the Society’s collection of historical agricultural equipment and what is probably Australia’s most important gravestone - that of pioneer farmer, James Ruse. Historic Glenalvon is not only beautiful it is classic in its architecture, and its construction." Our evening began with a tour of the property. We then broke into groups, and the investigations began! We held an EVP session in the old servants quarters, and it was sad to think that 10 to 15 servants were living in this one room, which was only slightly bigger than my bedroom. It is supposed there may have been a curtain down the middle dividing the men from the women, but that is just supposition. One of the ladies had the impression of a lady screaming in fear when in this room. There was a second floor to the stables which was calling me, so myself, and a small group of ladies, went up the narrow, rickety stairway, to a wooden attic room. This area is not open to the public, so it was a real treat to be there. It seemed very obvious to all of us that there was a male presence in the room. We all received the impression that he was quite the misogynist and had a liking for the petite blonde lady who came with us. She felt threatened and physically ill from the images of abuse he was planting in her mind. Finally, we all had a chance to take part in a "Victorian Seance" in the drawing room. This was the perfect venue for it. Andrea and Attila set the scene, with a round table, a candle burning and a bell to call the spirits. I felt we had a lady with us, who was not the owner of the house, but more of a housekeeper type role. Her name was Helen, and she was quite affronted that there were men in this 'woman's only' sanctuary. Evidence review yielded some surprising results. Firstly, we had an odd temperature fluctuation during the seance. It was only around Attila. The thermometer was ranging from 14 degrees to 20 degrees in a split second. Attila was complaining of the cold, but to me it felt very comfortable in that room. We also received an EVP in the room next to the drawing room. A very clear voice saying "Helen loves this". This validated my impression of a housekeeper type lady by the name of Helen. Another voice was captured as we were all waiting for the tour to begin. You can hear, very clearly, a male voice saying "Blow the candles out". There were no candles lit at this stage. And finally, in a room which, at one point in time, has been a Doctors surgery waiting room and a school class room, we caught the distinct sound of the keys of an old fashioned type writer being pressed. I was incredibly impressed with the Glenalvon Homestead and hope that Validate are able to secure the venue again in the future.